Avenatti repped an AAU coach whose team had just lost a Nike sponsorship worth $72k a year. 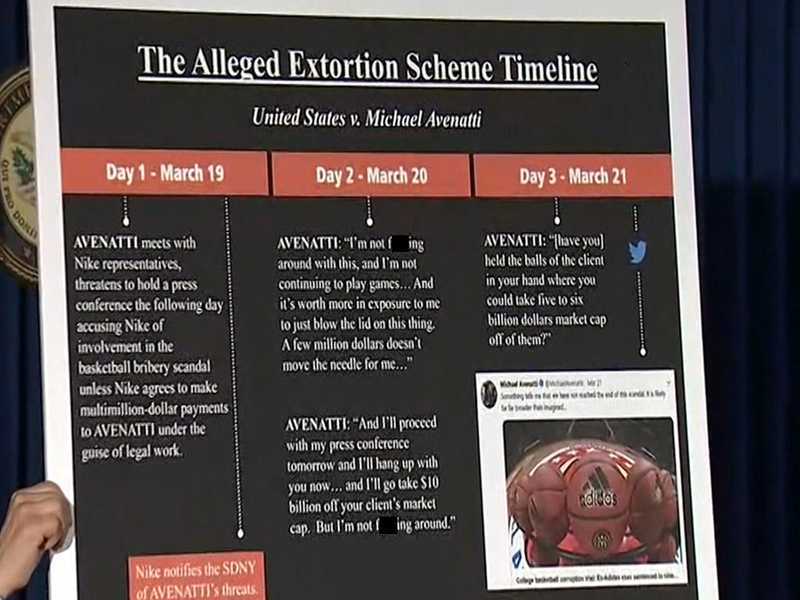 The coach claimed that Nike made payments to families of some high school basketball players, and Avenatti demanded payment from Nike to keep him quiet. Nike just broke its silence following the news conferences ... saying it "will not be extorted or hide information that is relevant to a government investigation. Nike has been cooperating with the government's investigation into NCAA basketball for over a year." The shoe giant goes on to say, "When Nike became aware of this matter, Nike immediately reported it to federal prosecutors. When Mr. Avenatti attempted to extort Nike over this matter, Nike with the assistance of outside counsel at Boies Schiller Flexner, aided the investigation." "Nike firmly believes in ethical and fair play, both in business and sports, and will continue to assist the prosecutors." If you recognize the law firm -- Boies Schiller Flexner -- the "Boies" is David Boies, the famous high-powered lawyer who's represented everyone from Al Gore to Harvey Weinstein. In fact, Boies was also heavily involved with Theranos -- the blood testing company -- and was featured in the HBO documentary "The Inventor: Out for Blood in Silicon Valley."